As any start-up evolves, it goes through different stages such as validating an idea or establishing product-market fit or scaling up. Whether you are a founder or a Product Manager, you need to understand the dynamics of product management as your start-up goes through different stages. Today my guest is a serial entrepreneur, Subinder Khurana. Subinder has a track record of establishing start-ups and successfully existing from them multiple times. He has been on the Advisory Board of several startups, including Druva Software, Authbridge, WTI Cabs, TAC Security, Denave, Survaider and Power2SME. He was part of the core team of marketRx which was acquired by Cognizant. 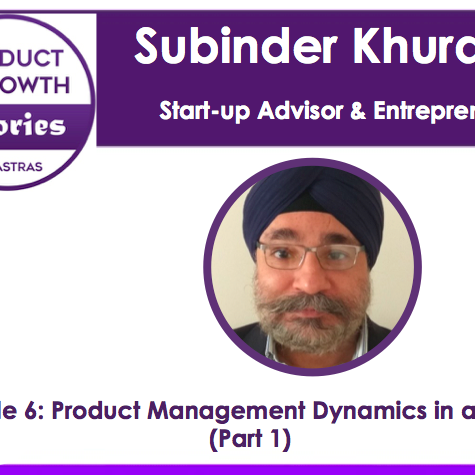 In this episode, Subinder unfolds a typical journey in a start-up and talks about dynamics of product management through this journey for a predictable success.